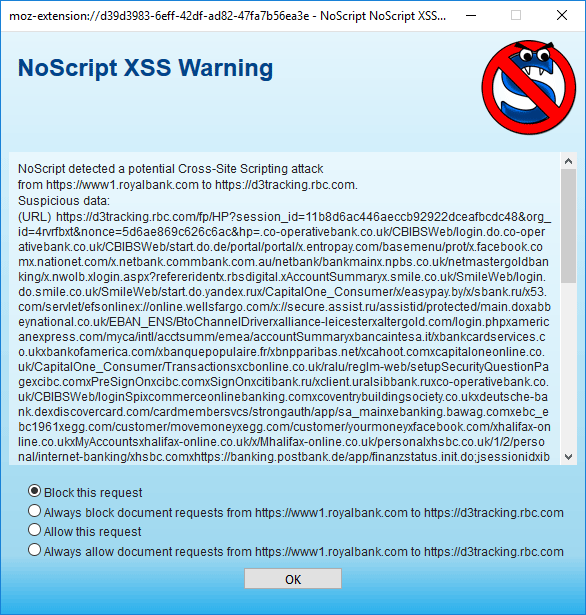 Potential Cross-Site Scripting Attack at RBC Royal Bank..? At first glance it appears that my login credentials will be tried at 50+ semi-related websites, in the hopes that I'm reusing the same username/password... (or is that not what's going on here..?) If that IS what's happening, I'm assuming my online banking could be easily compromised too..? Re: Potential Cross-Site Scripting Attack at RBC Royal Bank. I cannot reproduce because it seems to happen after the actual login (doens't happen with fake credentials, and the message points at a GET request: likely a post-login (stats tracking?) redirection, rather than the login submission itself, and a false positive. Maybe I can take a look at the actual payload if you copy and paste it as text, after double checking that (as I believe) there are no credentials embedded into it. Re: Potential Cross-Site Scripting Attack at RBC Royal Bank..? I know this is an old post,... I also have the same question. I had this problem last summer and chose to Block permanently the XSS request. This week, I created a new VmWare KUbuntu install and needed to setup my bank again, and this XSS error still happens today. Royal Bank login page, get XSS warning. I can reproduce XSS warning from many systems, and ISPs. (I have access to 2 ISPs and a bunch of computers). I copied the full link/XSS/code? provided by NoScript (similar to image above), (no sure how to offer it here without it creating a link to something bad). My MAIN concern, (since I can chose to block that request without any noticeable side effect on Bank login/transactions), is the actual Names of the Sites that link is referencing. I see Yandex and Bank names from Russia, Sicily, France, then SignIn and Login words with references to Paypal and Facebook. 2- Would it help (you) see if this a solvable problem (false positive)? 3- "Could you help ME" see if the BUZZ words (links) are a sign of Danger/Hack with my bank? This should send you to www1. royalbank. com/ cgi-bin/...etc.. When I grant RBC NoScript access, then XSS comes up. hey group, is this forum still active??? Is Mr Maone still helping or working here??? This forum is still active. Giorgio is still around, but he's probably very busy. Try posting it in code tags (paste it, select what you pasted, then click the </> button above the textarea where you write your message). If that still trips the spam filter, PM it to an active Mod (me, GµårÐïåñ, skriptimaahinen, therube, or Thrawn) and we'll try to post it for you. PMs to forum staff are not spam-filtered, and the spam filter is more lenient on us.